When Portland Bureau of Transportation Senior Engineer Norberto Adre visited Southwest Portland neighborhood association meetings, he heard a droning, repetitive plea. Local citizens wanted more sidewalks — many more sidewalks. And although that desire for more pedestrian infrastructure will persist, a modest yet potentially impactful project is in the works in one Southwest Portland hub. The project, which was presented at an open house in January, will include the addition of bike lanes on Southwest Vermont Street from 45th Avenue to 50th Avenue, a 12-foot-wide, shared-use sidewalk for pedestrians and bicyclists between 50th and 52nd avenues, narrowed lanes through the Vermont corridor and pavement repairs on Vermont Street from 30th Avenue to 65th Avenue. The pavement aspect of the project will mostly include repaving, but construction workers will also rebuild the base on a downtrodden area on 45th Avenue. There may also be a speed-limit drop along Vermont Street from 35 to 30 miles per hour. The paving aspect of the project is funded through the Fixing Our Streets measure — which Portland voters passed in 2016 — while the sidewalks are paid for via system development charges. Construction is slated to begin in May and end in October. Nearby residents and those involved with the project hope that the improvements will lead to a safer journey along Vermont Street for pedestrians and bikers. "It's a piece of the puzzle. Anytime you can get a piece of the puzzle, it benefits the community as a whole. I look forward to this project being done and seeing people walking and riding their bikes — just getting around here," Maplewood Neighborhood Association Transportation Chair Stephan Lewis said. A persistent group of citizens — as well as the lobbying of Adre — helped get the project on the books. One of those citizens was Tassia Owen, who told a scary story at a Maplewood Neighborhood Association meeting. While walking along the roadway shoulder from her home along Vermont Street to the preschool at the Southwest Community Center on 45th Avenue, Owen's daughter slipped on a rock, fell into the street and was nearly struck by a car. For Owen, the experience was infuriating and prompted her to take action. "I just can't believe that this is a city and we don't have the basic infrastructure for people to walk to the community center from two neighborhoods, and it's supposed to be the center of our community," Owen said. Owen helped form a joint Vermont Street Improvement committee for both the Hayhurst and Maplewood neighborhoods, which deliberated ways to advocate for funding. Using a GoPro camera, she also filmed herself walking along the dicey terrain to the community center to show the plight of those who attempt the trek. And at the neighborhood association meeting in which she talked about her daughter's close call, an understudy of former Commissioner Steve Novick happened to be in attendance. "She took my story back to the commissioner, and I can only assume they must have told the story to advocate for it," Owen said. Lewis is also a part of the joint committee. He grew up in the area and remembers walking through unkempt trails trying to reach Gabriel Park to play tennis as a teenager. Lewis has been active on issues such as transportation for the last 20 years and is currently a member of two boards, eight committees and a task force. He doesn't view appeals for funding as a competition with other projects, he says, but understands that the overall pie is limited. He's seen Southwest Portland-oriented projects put on the backburner in the past, but is happy this one is close to implementation. "You keep bringing it up, you write your letters, you listen to other people and find out what they need," Lewis said. "Sometimes it's your turn. If you make the right case for the projects that are important to your community, then it definitely increases the chances that it can actually get through." Lewis uses the word "accessibility" to explain why this project garnered funding. "Accessibility. There's a lot of people in the Maplewood neighborhood specifically that walk, that bike, and it's really difficult to get from our neighborhood out or back in," he said. Rick Burian, who lives on Vermont Street, says he heard rumblings of a similar project as far back as 20 years ago and is satisfied that the project is nearly underway. "I'm happy it's actually going to happen," he said. Burian often sees drivers speeding well above the speed limit along Vermont Street and hopes that a decreased speed limit will lead to slower driving. However, he hopes the narrower lanes don't create another safety hazard. "I've been told they're narrowing the driving lane by a small amount, and that concerns me because it's not a wide road to begin with," he said. "I don't know if that means slowing down, which is fine with me. People drive too fast." Lewis believes narrower lanes lead to reduced speeds. "People feel comfortable going 55 in areas of Southwest Portland, and that's not the environment we want to have. One of the ways you can correct that is by narrowing the lanes, and then people feel like it's more appropriate to be driving slow," he said. Despite the addition of myriad trails implemented by Southwest Trails Inc. and the Vermont Street Project and a few other projects in the pipeline, Lewis says Southwest Portland is far from a bike- and pedestrian-friendly region. "As far as the transportation system in Southwest Portland specifically, people rely so much on their cars because they don't feel safe using other modes of transportation. They don't feel safe walking through a busy street. There's low connectivity between streets, so you're forced onto streets that you don't feel comfortable walking," he said. Owen hopes that after the renovations, her kids can walk and bike to school safely. "It's a nice option for my kids to be able to walk to school or ride their bike to school. The way things are right now, that would never have been an option for us," she said. 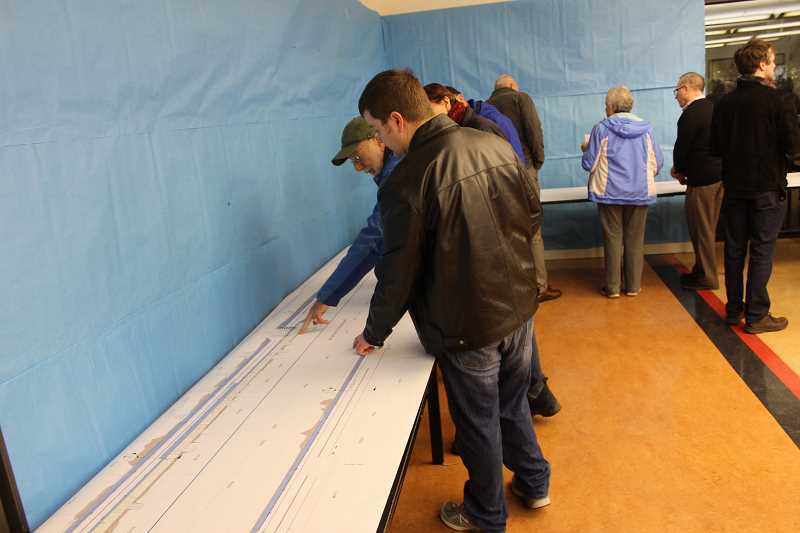 Adre received some positive feedback from nearby residents at the open house. But Southwest Portlanders thirst for more sidewalks, and safer transportation is not close to being quenched. "They like it. They thank me for the sidewalk, for the work," he said. "And they want more sidewalks. That's the way it goes."